Mr. Locke has carefully chosen five men who are alone in the world to work in his new locksmith shop, Locke and Keye. 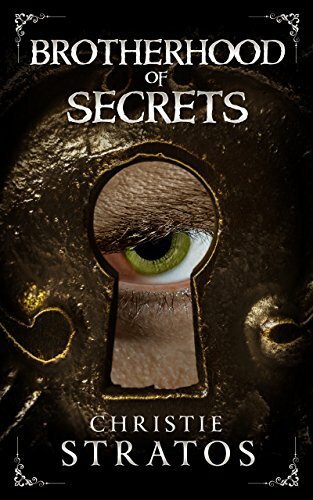 As a small tightknit group, these men must recite a daily mantra crafted for them by their new employer: “Brothers in the art of keeping secrets.” What kinds of secrets must they keep hidden? 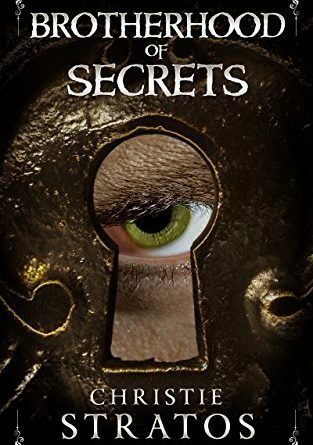 All five men soon discover that behind locked doors hide many secrets, doors their talents must unlock to uncover the secrets within or to create locks to keep these secrets hidden away forever. As secrets are shared and withheld, these men become a family, yet another secret remains to be shared as each man has a particular use that only Mr. Locke is aware of. What will the newly formed brotherhood discover about the town surrounding their shop and what will they discover about their mysterious employer? Nothing is what it may seem and absolutely no one can be trusted. Author Christie Stratos beautifully blends together suspense and mystery in a Victorian era setting while also throwing in a healthy dose of the strange and the macabre in her latest book Brotherhood of Secrets. While this is the second book of her Dark Victoriana Collection, it is one that can most certainly stand on its own and successfully captures the attention of any reader who picks it up. Stratos is to be commended on how she crafts her story for she tackles many different elements and successfully weaves them together to create one uniquely enticing tale. Fans of historical fiction will be impressed with how well Stratos writes this time period, making it more of a realistic Victorian London rather than fantasy or steampunk. Fans of mystery will enjoy the many secrets scattered throughout the story’s entirety and fans of suspense will be thrilled once they discover the secrets that are far too dangerous to keep. The suspense and mystery will also reach out to fans of the dark and the strange for Stratos’ storytelling is similar to that of writers such as Neil Gaiman or Tim Burton. Along with her excellent blend of elements, Stratos also molds a seamless blend of dialog and prose. She gives just the right amount of detail to paint a clear picture within the minds of the readers and writes the perfect amount of dialog to share the character’s thoughts, whether the characters are speaking to one another or expressing their thoughts to the readers. Even with the knowledge of nearly all of the characters’ inner thoughts, many mysteries still abound as unexpected twists and turns leave readers unsure as to what will happen next. The amount of mysteries and secrets most certainly holds true to the story’s title. Even secrets are kept and shared amongst the brotherhood that is formed. Stratos’ strength lies in her characters for they are the ones who truly carry the story along. Mr. Locke, Timothy, John, Luke, Matthew, and Jude are all strong and complex characters each with his own unique personality. Headstrong, sophisticated, and always the gentleman, Mr. Locke is a man to be admired, yet mystery enshrouds him as he never truly opens up to anyone. Matthew is always trying to be noticed for his deeds and seems to want to be the right-hand man to Mr. Locke. Luke is an observant man who wishes to make a good impression and assists anyone who is in need of help. More observant than Luke is John who notices strange goings-on that he questions and always makes sure to keep his guard up. Timothy is a young lad who is beginning his first career and while he may be naïve, he watches and learns quickly from his colleagues. Jude is the wild card of the group for he seems to have many motives… one is never truly sure if Jude wishes to help or harm. Each of these characters personalities are introduced and fully examined as the story progresses for there are no chapters in Brotherhood of Secrets, but rather sections that read almost like journal entries told from the perspective of each character. Of the five main Locke and Keye employees, it seems Jude receives most of the attention, but the other characters have a fairly even amount of spotlight time. This allows readers to get a good look into everyone’s personality and motives with the exception of Mr. Locke whose motives are so well-hidden readers will become incredibly curious as to what sort of man he truly is. A rather intriguing fact to discover is, aside from Mr. Locke, the main characters’ names are all names found within the bible. Whether Stratos intended this or not, the names almost seem to follow the characters of the bible and there are even subtle hints to biblical references as the story continues. Do not let the knowledge of Brotherhood of Secrets being the second of a series stop readers from picking up a copy. One does not need to read its predecessor Anatomy of a Darkened Heart to enjoy this novel that can most certainly stand on its own. Stratos has released a well-crafted story that will reach a wide audience of readers, gripping their attention with suspense and mystery during a dark and strange Victorian era. Brotherhood of Secrets offers an excellent introduction to Stratos for those new to her work as well as an excellent addition to her library for those who have been with her since book one. With only two books currently out for her Dark Victorian Collection, who knows what other captivating works she will release next. Hopefully, readers will not have to wait too long to find out.